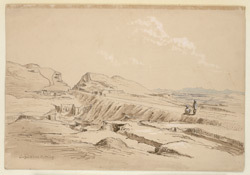 Pen-and-ink and water-colour drawing of the Gujarkhan Cutting on the Peshawar Road in the North-West Frontier Province (Pakistan) by Sir Henry Yule (1820-1889) in 1860. Inscribed on the front in ink is: 'Goojarkhan Cutting'. Sir Henry Yule joined the Bengal Engineers in 1840 and was involved in many engineering projects during his career. In 1843 he was in the Punjab working on the west Jumna canals while from 1845 he worked with a group of young engineers in restoring and developing the old Mughal irrigation system in the North-West Frontier Provinces. In 1855 Yule became Under-Secretary in the Public Works Department of the Government of India and was largely concerned with irrigation works and the development of roads and railways until his retirement in 1862.